Dimensions: Guest Book: 10" x 6 1/2"; Pen Set Base: 5 1/4" x 3 1/4"
Covered in white cotton canvas with artwork evoking love and commitment sentiments such as "True Love" and "Together Forever" printed in black, this vintage-inspired guest book features a beautiful rustic paper floret in its upper left hand corner. 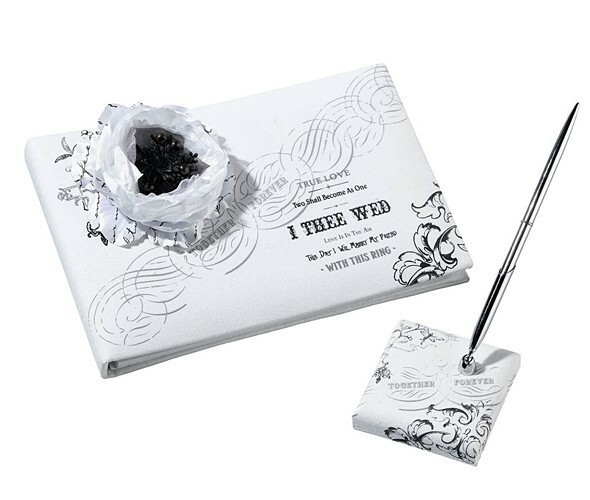 The guest book holds 30 pages accommodating up to 580 signatures and the silver pen has black ink. PLEASE NOTE: Pictured LOVE key is not included.